The timing of the signing of a preliminary agreement between the US and Poland to host part of Washington's controversial missile defence system on Polish soil might seem curious. The US says the shield will prevent missile attacks by "rogue states"
At a ceremony in Warsaw, both the US chief negotiator, acting Under-Secretary of State John Rood, and Polish Foreign Minister Radoslaw Sikorski played down any connection to the ongoing conflict in Georgia. 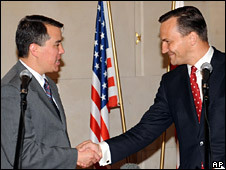 Just 24 hours earlier, Mr Sikorski announced that the US had made a new, improved offer during the latest round of talks in response to Poland rejection of the terms last month. However, the Polish defence minister made a clear connection. "Above all, it seems that the Americans changed their opinion as a result of the situation in the Caucasus," Bogdan Klich told the Polish newspaper, Dziennik. "In Washington's eyes, this conflict proved that Russia was not a stable partner for the States." The US wants to locate 10 interceptor missiles in a former military base near Poland's Baltic Sea coast. It says the interceptors will protect both it and much of Europe against long-range missile attacks from what it calls "rogue elements" such as Iran. Sandwiched between Western democracies like Germany to the west, and undemocratic Belarus and the Russian enclave of Kaliningrad to the east, Polish officials see Russia as a bigger threat to its security than Iran. Although it is a member of both the EU and Nato, the Polish government believes only the US can guarantee its security. Certainly, Moscow has threatened to target its own missiles at the base. The Kremlin says the system will upset the regional security balance and could be used against itself. That is why that for months Warsaw pushed hard for significant US military assistance. Now, the US has met its main demands. Under the agreement the US has declared it will come to Poland's assistance in the event of an attack from a third party. It has also promised to help modernise the Polish armed forces. 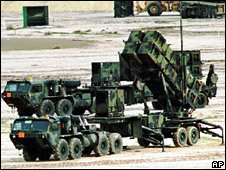 And crucially for Poland, the US has agreed to station a battery of Patriot missiles and US servicemen on Polish soil to beef up the country's short and medium-range air defences. "We will have here in Poland, not one, but two American garrisons. We will have one base used to protect the whole of the North Atlantic Treaty against long-range ballistic missiles," Mr Sikorski said after signing of the agreement. "We will also have a battery of 96 Patriot missiles located in a spot chosen by Poland according to our defence needs." "This is the beginning of the strengthening of the Polish defence capabilities and making the Polish-American alliance concrete." 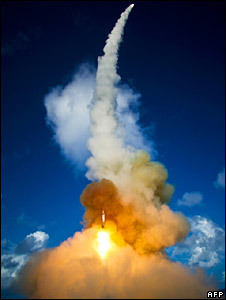 Despite Washington's insistence that they have nothing to fear from the missile defence shield, the deal is bound to anger the Russians. Moscow does not want such an installation in a former Soviet bloc country. Already, the Russian Foreign Minister, Sergei Lavrov, has cancelled his upcoming trip to Warsaw. Relations between Moscow and Warsaw had improved following the election of the government led by Polish Prime Minister Donald Tusk late last year. Mr Tusk even paid a visit to the Kremlin before the White House. A long standing Russian ban on Polish meat and agricultural products was lifted and Warsaw dropped its opposition to the start of negotiations on a new EU-Russia partnership agreement. But after the conflict in Georgia broke out, Poland was vocal in its support for Georgian President Mikhail Saakashvili and urged both the EU and Nato to take strong action. Now, with the signing of this agreement, relations between the two countries will be in the freezer, at least in the short-term.